The NFNL is accepting registrations for players wishing to nominate for tryouts for the 2019 open and under-19 netball representative teams. Heidelberg Football Netball Club is holding a trial session for the upcoming NFNL winter season on Wednesday February 27. Montmorency Football Netball Club is seeking netball players to join for the 2019 NFNL winter season. 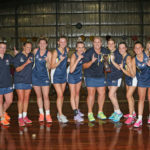 Hurstbridge Football Netball Club is seeking netball players to join for the 2019 NFNL winter season. Craigieburn Rep Netball Club is holding trials for the 2019 NFNL winter netball season.